he purpose of this Patient Insights Network (PIN) is to create a global database where doctors, researchers and families can connect to better understand food protein induced enterocolitis syndrome (FPIES). The goal is to spark improved diagnosis, management and treatment options, as well as the empowerment of patients and families through knowledge, connections and continued support. The FPIES Foundation is partnering with Invitae to bring you this registry, the first of its kind globally. Registered families will have opportunities to participate in research and informational surveys and immediately see the results of those surveys. All patient information is kept confidential and FPIES families will always own their information and be able to opt-in or opt-out of participation. Knowledge is power. By joining the FPIES Foundation PIN, you enhance knowledge of FPIES and provide information for doctors to research and understand this rare condition. The FPIES Foundation is an incorporated 501(c)3 non-profit with the mission to overcome the challenges of food protein-induced enterocolitis syndrome (FPIES) by offering tools for education, support and advocacy to empower families and the medical community. 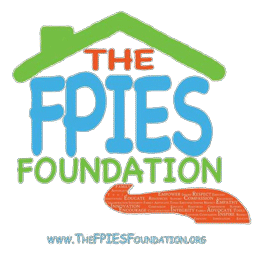 For more information, please visit: www.thefpiesfoundation.org. We are honored to introduce this latest initiative, the FPIES Foundation PIN.